The most important part of protecting your family from a hurricane is simply getting out of the way of an approaching storm. While making sure that your home is adequately insured is critical to preparing for hurricanes, you also need to consider the techniques and materials used to build your home. The fact of the matter is, said Kean Jenner, a professional engineer for Haag Engineering Company, which specializes in the analysis and failure of structural systems (e.g. buildings), the roof of your home plays a key role in keeping the structure together during a big storm. "Homes are generally damaged by these storms when negative pressures created by high winds get up under the eaves and lift the roof up off the walls, which can then lead to an unraveling of the entire structure that can lead to a complete collapse," he said. According to nearly everyone we spoke to for this story, the gold standard of effective and tested building strategies for homes in hurricane prone areas comes from a nonprofit organization called the Institute for Business & Home Safety (IBHS). In particular, the organization has created a three level framework to help home builders and owners create safer homes that can withstand the high winds and water damage associated with hurricanes. Level 1 -- These tactics, which can be done either during construction or after the roof and house have been built include spreading a foaming agent (see Figure 1) from the underside of the roof (e.g. 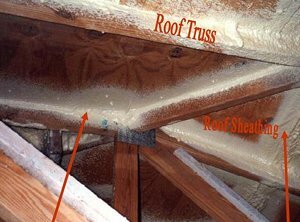 in the attic) in-between the seams of the decking, which creates a secondary water barrier and enhances the strength of the sheathing. Another option, said Rem Brown, program manager for IBHS' Fortified... for Safer Living Program, is to make sure the soffits are attached to the house properly. In the aftermath of Hurricane Charlie, it was found that more than 70 percent of houses with water damage in the walls and attic had soffit damage. "There are light-weight soffits that have been blown off houses and allowed water to come into the house," said Brown. "These can be retrofitted by using caulking and additional screws to enhance and strengthen how these soffits are attached to the house." Level 2 -- This level includes doing work to protect the various openings of the house -- windows, doors, garage doors, and etc. -- so that they are wind and water resistant. "If winds find their way into your house," said Brown, "it will create additional pressure, which could help lift the roof up off the house." Level 3 -- These strategies address construction-related aspects of the house that can be applied to protect it from wind by improving the roof as well as the connections in the entire structure -- roof to wall and wall to foundation. 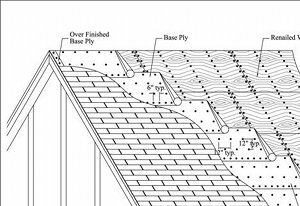 Working our way down from the top of the roof, Brown said it is important to ensure that the roof covering -- the shingles or any other top layer -- is rated for high winds and are adequately nailed to the decking beneath (see Figure 2). A second layer between the roof covering and decking should also be applied as a water barrier. "Even though the roof covering may be high wind rated, they don't always perform or are not installed as well as they could be, and they fly off in high winds," he said. "The secondary barrier is installed in this case so that water will not find its way into the house." Working down from the roof, the next issue is ensuring the roof and walls are properly attached and reinforced. According to Jenner, of Haag Engineering, there are essentially three tiers of reinforcing techniques that could be used. The first tier is nailing sheet metal ties to the sides of the rafter and the top plates of the wall, which Jenner said is a nearly universal requirement for all new home construction. "This takes the wind resistance of the roof structure and by extension the entire structure to a whole new level for just a few hundred dollars," he said. The second tier is using sheet metal ties that attach to the side of the rafter and run down the wall and attach to the floor plates of the wall and the floor structure. "This means you have everything tied together so the wall cannot be pulled apart by lifting forces," said Jenner. The third tier is installation of threaded steel rods that attach to the rafters and run through the top plates of the wall to the floor structure of the wall. "These serve the same function as the sheet metal ties, but to a higher standard," said Jenner. This last level of protection is the hardest to retrofit, said Jenner and Brown, because it requires pulling wall material off the home in order to install these devices. However, homes built in hurricane prone areas are required to have this higher level of protection. If you are buying a home, though, you should check when it was built and determine if it meets current standards. "All of the roofs in coastal areas now have to comply with codes in that area," said Jenner. "It is difficult enough to get insurance in coastal regions because they have their own strict requirements and will inspect roofs and dwellings to ensure they are in compliance with their specifications. So in order to get insurance, you may already have to meet a high standard." The next issue to consider is materials. According to Jenner, all roofing products have wind ratings and manufacturers require contractors to apply these products according to certain specifications. Some contractors will even add additional nails to increase the wind resistance of the roof covering. "You can achieve very high wind resistances with a tile roof depending on how far you go in terms of the number and types of fasteners that are used," said Jenner. "You can also use an asphalt adhesive down at the starter course of tiles around the entire perimeter of the roof as well as additional nails to increase wind resistance further." It is also possible, depending on the types of improvements you make and the materials you use, to get a break on your homeowner's insurance. "Some states, such as Florida, do mandate discounts when you make an improvement to your home," said Candace Iskowitz, public affairs officer for IBHS. "And there are some states that offer discounts through their wind pool [state insurance program for hurricane prone areas] when improvements are made to protect a home from high winds due to large storms.